I have always thought that having a child was the most terrifying thing a person can experience. Think about it: youre bringing a new life into the world, youre forced to completely change the way you live and behave, and its up to you to keep that baby alive. What could be scarier than having another life rely on you to survive? Well, the new After Dark Original movie Dark Circles shows the struggles of being a new parent intensified by unexplained activity, making the whole having a baby thing seem like the least of a parents worries. 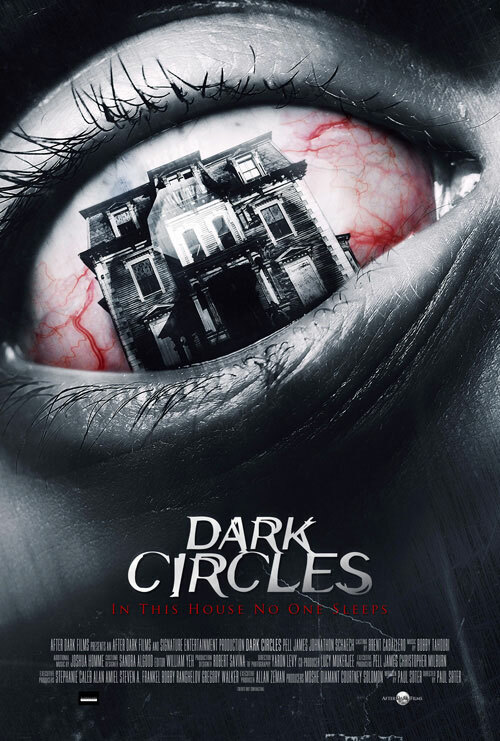 Dark Circles is directed by Paul Soter of Broken Lizard fame, and it follows new parents Penny (Pell James) and Alex (Jonathon Schaech) as they adjust to their new situation, as well as their new home in the countryside. While Penny worries that her lack of experience and poor relationship with her mother will affect how she parents her son, her musician boyfriend Alex questions having to give up his life in the city where he performed with a local band. The couples respective reservations about the changes in their lives already has them on edge, but when each of the new parents begins seeing things in their home, they arent sure what to believe. On top of that, their son stops sleeping through the night, leaving the parents exhausted and almost unable to function throughout the day. Although the story focuses on both parents and the struggles they must overcome, Dark Circles spends a lot more time on Penny and her internal and external struggles with being a new mother. In the beginning, Penny is overly nervous about her babys impending arrival; she has nightmares about not being able to protect him, and she questions her caring abilities to her friend just before giving birth. It is very clear that Penny wants to have the picturesque family and be the perfect mother; however, when strange things begin happening, she starts questioning her sanity and almost loses faith in herself, and her relationship with Alex. In the midst of feeling down physically and mentally, Penny finds her inner mama bear and faces the evil that threatens her family, proving that nothing can come between a mother and her child. James shines in the role as a new mother trying to figure things out while maintaining her sanity in a difficult life situation. While Schaech is acceptable as her significant other, its James performance that carries the film and makes you feel her exhaustion and pain as she navigates through motherhood. Along with the laudable performance from James, director Soter shined in his ability to create some creepy scenes that didnt rely on typical jump scares or an overabundance of gore. He set a pace for the film that allowed the audience to feel the tension between the characters, as well as an eerie atmosphere that made you question if what we were seeing was real or just a hallucination of the couple. That being said, the ending felt rushed and anti-climactic. It felt like a nice bow was tied on top of everything, making the struggles the characters went through feel less important. It wasnt an awful ending, but it felt familiar and predictable. But, just because I didnt like the ending doesnt mean I didnt like the movie. Dark Circles is a fun, creepy movie that depicts problems that every couple faces with new parenthood, just with a little paranormal activity thrown in the mix. The performance by James as Penny is compelling enough to make you want to see if she succeeds or fails, and its believable enough to make you forget that youre watching a ghost story. Soters direction made for a genuinely creepy film that is worth watching with the lights off.